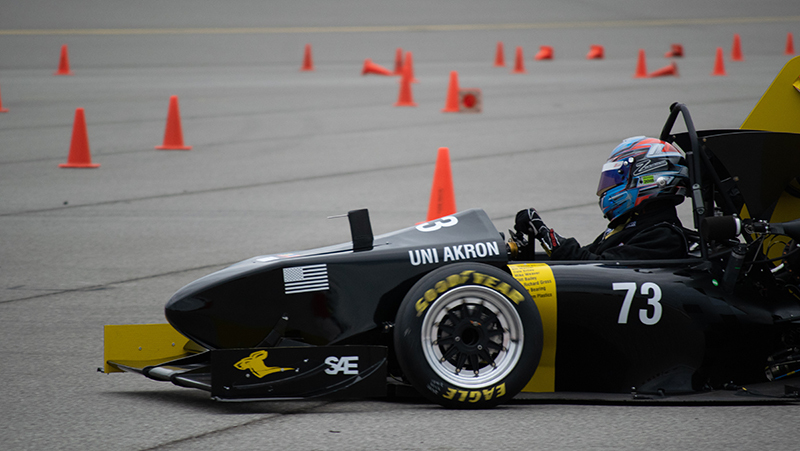 Zips Racing, the Society of Automotive Engineers Formula Team at The University of Akron, placed sixth overall out of 114 teams from around the world in the Formula SAE Michigan competition May 9-12 at Michigan International Speedway in Brooklyn, Mich. The UA team was the highest-ranking from the United States, and one of only three teams from the U.S. to finish in the top 10. Over the course of four rainy days, the team put its new formula-style racing car, ZR18, to the test in eight categories: engineering design, cost, business presentation, acceleration, skid pad, autocross, endurance and fuel efficiency. The Zips Racing team at the Formula SAE Michigan competition, where it placed sixth overall. The student in the driver’s seat is Matthew Evans, senior mechanical engineering major and powertrain leader and main driver for the team. Zips Racing placed 11th in both design and business presentation, in which professional engineers judged the team on its engineering decisions and marketing pitch for the car, respectively. The team also placed seventh in the endurance event (a 22-kilometer race) and fifth in fuel efficiency. Mechanical engineering major Robert Kucera, in charge of brakes for Zips Racing, drives through the practice course at the Michigan International Speedway in Brooklyn, Mich.
Chris Chatfield, the former Zips Racing captain who graduated with a B.S. in Mechanical Engineering shortly after the competition, has some encouraging words for his successor. It will now be senior mechanical engineering technology major Ezra Malernee at the helm, preparing the team for its next competition, Formula Student Austria, at the Red Bull race track in Spielberg, Austria, July 29-Aug. 2. Last year, Zips Racing finished fifth overall among combustion teams, and first in fuel efficiency, in Austria. Chatfield is confident that the team will qualify for the Formula Student Germany competition this August in Hockenheim, Germany, where he hopes it will improve upon last year’s eighth-place finish.